[172 Pages Reports] The global interposer and fan-out WLP market is expected to be valued at USD 13.42 Billion by 2022, growing at a CAGR of 28.09% between 2016 and 2022. The research methodology used to estimate and forecast the interposer and fan-out WLP market begins with obtaining data on key vendor revenues through secondary research. Some of the secondary sources referred to for this research include information from various journals and databases such as Hoovers, Bloomberg Business, Factiva, and OneSource. The vendor offerings have also been taken into consideration to determine the market segmentation. 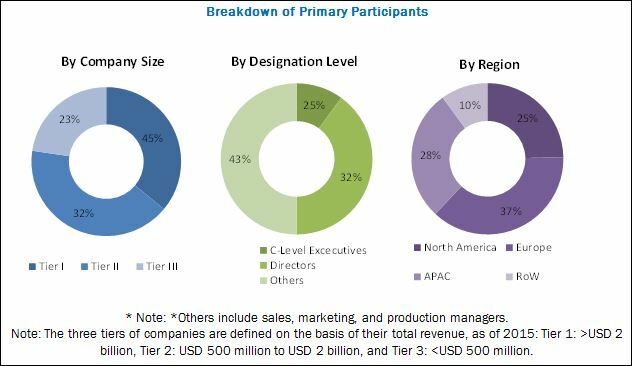 The bottom-up procedure has been employed to arrive at the overall size of the biosensors market from the revenues of the key players in the market. After arriving at the overall market size, the total market has been split into several segments and subsegments, which have then been verified through primary research by conducting extensive interviews of officials holding key positions in the industry such as CEOs, VPs, directors, and executives. The market breakdown and data triangulation procedures have been employed to complete the overall market engineering process and arrive at the exact statistics for all segments and subsegments. The breakdown of the profiles of primaries has been depicted in the figure below. The ecosystem of interposer and fan-out WLP market comprises a network of integrated circuit designers, raw material suppliers, foundries, and outsourced semiconductor assembly & testing services (OSATS) players, among others. The major companies operating in the market include Taiwan Semiconductor Manufacturing Company Ltd. (Taiwan), Samsung Electronics Co., Ltd. (South Korea), Toshiba Corp. (Japan), Advanced Semiconductor Engineering Group, (Taiwan), and Amkor Technology (U.S.). The prominent companies in the market include well-established, financially stable, and technically sound players that have been operating in the industry for several years and have diversified product portfolios, proprietary technologies, and strong distribution networks through collaborations and acquisitions. 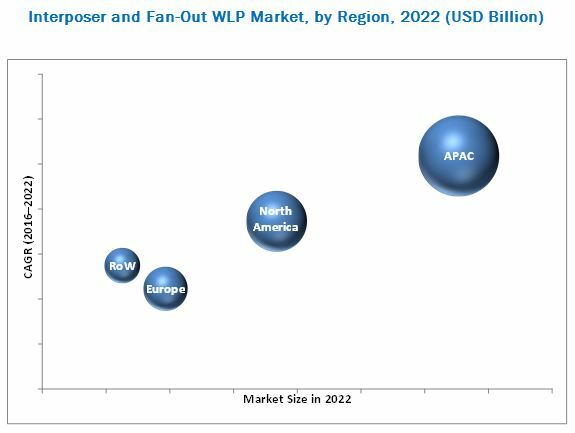 The interposer and fan-out WLP market has entered the growth phase and is expected to be valued at USD 13.42 Billion in 2022, growing at a CAGR of 28.09% between 2016 and 2022. The major factors driving the growth of the market include rising trend of miniaturization of electronics devices; increasing demand for advanced architecture in smartphones, tablets, and gaming devices; and increased usage of advanced wafer level packaging technologies in MEMS and sensors. The market for through-silicon vias (TSVs) is expected to grow at a high rate between 2016 and 2022. The major factors driving the growth of the interposer and fan-out WLP market for TSVs include high interconnect density and space efficiencies. Also, the compact structure of TSVs has led to the increase in its demand for use in various smart technologies, including wearable and connected devices. The market for memory applications is expected to grow at a high rate between 2016 and 2022. The use of interposer and fan-out WLP is expected to provide a cost-effective solution and drive the wide-scale adoption of this technology in potential end products. The average number of stacked dice in memory modules is likely to grow with the increasing usage of interposers. Moreover, innovations in advanced data storage such as flash memory, hybrid memory cube, and so on are creating a demand for interposer and fan-out WLP to develop high-performing compact memory solutions. In addition, the advent of complex device designs has brought new challenges in interconnections such as need for higher I/O density and performance requirements, which are efficiently addressed by interposer and fan-out WLP. Among all the major end-user industries, the consumer electronics industry accounted the largest share of the interposer and fan-out WLP market in 2015. The growth of the market for the consumer electronics is mainly driven by the increasing demand for smartphones, tablets, and other portable computing devices, which can be developed using advanced packaging to provide small form factors and improved performance at relatively lower cost. APAC accounted for the largest share of the interposer and fan-out WLP market in 2015. The major factors driving the growth of the market in APAC include the presence of major semiconductor foundries, including TSMC (Taiwan) and UMC (Taiwan); proximity to major downstream electronics manufacturing operations; government-sponsored infrastructure support; tax incentives; and availability of skilled engineers and labor at a relatively low cost. Thermal-related issues due to higher level of integration are the major retraining factor for the growth of the interposer and fan-out WLP market. Taiwan Semiconductor Manufacturing Company Limited (Taiwan) is one of the leading companies operating in the interposer and fan-out WLP market, followed by Samsung Electronics Co., Ltd. (South Korea) that provides advanced packages consisting fan-out WLP and TSV integration to address the need for high-performance and miniaturized products. Companies in the market are strengthening their product portfolio by launching new launches and investing more in R&D; they are increasingly undertaking partnerships and collaborations to develop new technologies.